The ARTEC astrograph series represents a new kind of instruments due to a strong and precise mechanical system with the use of high-end optics. The ARTEC project was born in 2011 form the intuition of Mr. Seveso and then it was developed more and more with the help of our engineer Mr. Simeone. Our astrograph use the classic Newton native F/4.0 optical system consisting of a parabolic primary mirror in Pyrex aluminised and treated with a reflection of over 93%, secondary mirrors has the same type of processing and treatment. The carbon tubes are made with 3K twill with a thickness of 2.5mm, painted externally with a semi-matt and dust proof finish. The tube has an anti-dusted varnish coating inside it, this work is done to eliminate any kind of internal reflection and allows to have an evenly roughened surface. All the mechanics are made of Aluminium 6061 with CNC machines and some details are made through laser cutting. For the focuser we choose to use one of the most well know instruments on the market: the Feather Touch FTF3015B-A. This incredible and high-precision focuser features a rack and pinion system able to manage high loads capacity without any slippage. The focuser is equipped with the standard 10:1 micrometric reduction and it can be equipped with any standard Feather Touch motor kit. 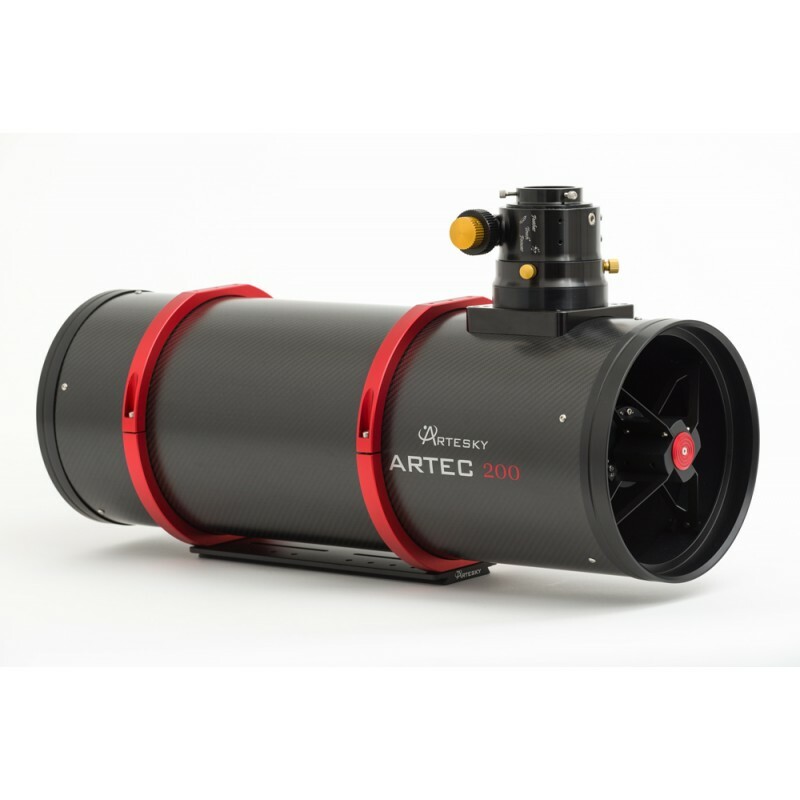 Thanks to the most advanced optical and mechanical design software used during the development, the ARTEC series offers a computer-optimized OTA to achieve uncompromising rigidity; all metal parts are CNC machined to guarantee optimal accuracy, ease of use and stability of the collimation. The ARTEC astrographs deliver stable focus over a wide range of temperatures thus limiting to the minimum the need for iterated refocusing operations - an important condition when using instruments with fast focal ratios during long imaging sessions. All components are produced using only the finest materials available, such as special lightweight aluminium, stainless steel and bronze. The sturdy spider of the secondary mirror support is made of laser-cut stainless steel. The high resistance anodization is chosen for unbeatable resistance to all enviromental conditions. Finally, the generous extraction of the focal plane allows the use of the most challenging imaging trains, whether they are CCD, CMOS or the more popular digital cameras. We reccomend the coma correctors which we have tested and proved suitable to fit the optical design of our astrographs. Some coma correctors can also reduce the focal lenght, so the system can reach the impressive focal ratio of F/2.8: as every experienced observer can testify, an outstanding mechanical construction is vital for proper collimation and reliable usage of such ultra-fast systems, an area where the ARTEC series sets the standars. We designed the ARTEC astrographs series to serve a market of discerning astrophotographers who are especially concerned with ease and stability of collimation, optical quality and repeat ability of results. To achieve all these goals, we soon realized tha we couldn't look anymore at the telescope as at a standalone entity, but we had to consider it for what it is: a part of an acquisition system which includes everything from the tube of the CCD. For example, in the design stage we paid special attention that no tilts are introduced by the draw tube of the focuser, we observed that several well-known focusers are simply unable to deliver according to their specs and to their price and that the carbon tube shows no flexures under the cantilever load of heavier cameras. Also, when delivering complete instruments with correctors, we make sure that the mechanical adapter between the focuser and the corrector is custom machined on the outside diameter of each individual corrector, to prevent misalignments in the optical train. In our view, the main technical advantage of the carbon fiber, versus the thin metal used in some Far-East constructions, is more related to its thermal stability and overall rigidity than to just lighter weight. This having said, there is clearly a technical cost to pay for all this extra rigidity and stability, and the weight of the ARTEC 200 is in turn somewhat higher than of other telescopes with the same aperture and optical design; it is still however fully manageable in the field, and well within the practical working range of very common and affordable mounts.